Terence Davies' adaptation of Lewis Grassic Gibbon's 1932 novel about one woman's life in Scotland certainly looks the part. Essentially a coming of age story, it's the tale of Agyness Deyn's Chris Guthrie, who toils under the yoke of an oppressive father (Peter Mullan) on their homestead. As time rolls on, Chris' life changes under the circumstances and in the distance, the rumblings of the First World War roll ever closer. Sunset Song was a passion project for Davies (as evidenced by his introduction that he "made it with his heart, and I just ask you to watch it with yours") - and from the very yellow opening title card that fades into the corn of a field, it's fair to say the director's passion springs from the screen. While focussing repeatedly on Deyn's face gazing wistfully into the distance (perhaps a little too often does he bathe her in light), Davies' careful framing, slow panning and scene building is clearly in evidence. His is a film that oozes class on the screen and that feels like a sublime telling of a tale he clearly holds true. From the brutality of the father via beatings in the barn to the eventual drums of war being sounded, the film's desire to have its audience luxuriate in its trappings is obvious. 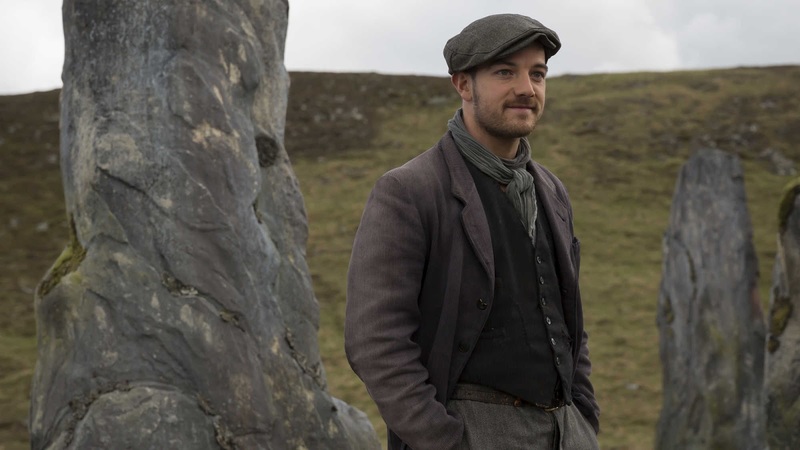 And yet, with the narration of proceedings, and Deyn's graceful and committed performance, Sunset Song lacks a certain engagement within the audience. It commands your eyes and Davies' attention to detail pours from the screen. In lighter moments, Chris' character comes through, and there's a playfulness with the language and it's delivered in a spry fashion. But this is a film that knows what it's doing and does so with relative ease of execution. 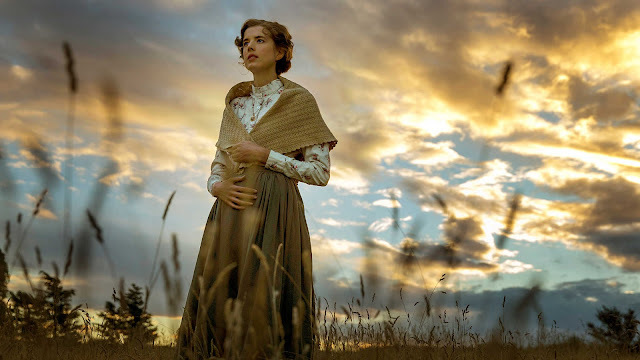 The shine comes from some of the shots, as the familiar story plays on - Davies' lavishing of events with his directorial eye, coupled with Deyn's performance are the reasons to watch Sunset Song. It's a wistful piece that is perfect Saturday afternoon viewing of yesteryear, but at times, totally emotionless.